Hear from top manufacturers such as GE, Toyota Motors, and Lincoln Electric among others about their growth strategies, labor market challenges, and innovation road maps to determine the direction of your future investment. Step through real-world lessons on how to lead your employees through the digital technology revolution. Get answers to your most pressing questions about lean and continuous improvements to increase efficiency and reduce waste. Hear keynotes sharing innovative ideas, compelling insights, and effective strategies to improve your operations. Meet and exchange ideas with your peers in multiple networking opportunities. Fix Event free consults explore your most challenging manufacturing issues, available resources, possible solutions, and even next steps with Smart Manufacturing domain and subject matter experts. Come visit us at Booth 850. Drop off your business card for the opportunity to win a YETI cooler, complements of QLS. The turnout for the show was large, indicating that the economy is positive and the manufacturing community is investing capital for growth. The energy in the hall was tremendous and we left Chicago with rising expectations for a strong 2018. There was real substance at the show. We had solid, in depth discussions with people representing a wide range of company disciplines from the manufacturing floor to product development to C-level executives. We met people who are passionate about what they do and knowledgeable about their company’s value – an enlightening experience in a world that seems a little crazy these days. It is good to know that manufacturing innovation is alive and well in North America! We had lots of opportunities to discuss our favorite topic – quality liaison services. It was interesting to meet so many people who were not aware of the value provided by a company like QLS. In our discussions we were able to explain that Suppliers benefit from having an on-floor representative in their assembly OEM customers’ facilities by gaining instant reaction to quality issues and by having strong technical expertise available for special projects. We also talked to several OEM assembly folks who readily acknowledged the positive impact on both quality and through-put provided by on-site Supplier representation. If we met you at the show – thanks for stopping by. If we didn’t see you, we’ll catch you next year – or better yet, give us a call at 615-590-4280 or send an email to discuss how we might help you prosper in 2018! There were substantive presentations at the show on issues affecting the manufacturing community. If you attended you might have gained a totally different perspective on the impact of robots on manufacturing labor or learned some great techniques for eliminating complexity from strategy implementation. You could have taken a deep dive into how the Internet of Things will drive a new expansion of lean principles. And, of course, there was the ever-popular bowling ball pulverization demonstration! John Irvin wins the Yeti! 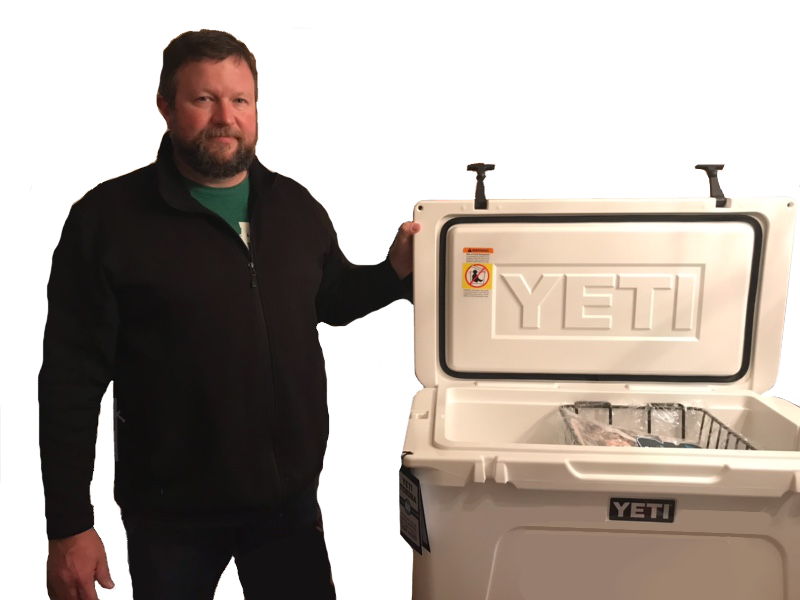 And finally, we had a lot of fun running a little contest to give away a beautiful YETI 65 cooler. John Irvin of Caterpillar was the lucky winner. Congratulations John! We hope you enjoy the cooler for years to come! We hope to see you next year at the Assembly Show. When Motorola introduced their Six Sigma quality methodology in 1986, their goal was to connect a 3.4 PPM quality level to both increased customer satisfaction and improved corporate earnings. They built a system that tied data-driven decision making into every facet of managing the company and in the process, created an industry revolution that continues to be the foundation for many companies’ quality programs today. It tied decision making to a clear definition of goals aimed at bottom line improvement. That process allowed Motorola to streamline their project prioritization and eliminate many programs that would take time and money but not show sufficient earnings impact. It introduced an “attainable goal” review to help teams understand the elements of a challenge they could control and avoid “boiling the ocean” in trying to eliminate all variability. Its education system rewarded the mastery of various quality management capabilities with the ultimate awarding of the Six Sigma Black Belt. This simple but powerful idea gave employees a continuous improvement process with clearly defined award levels. It tied customer satisfaction to the daily management of Motorola’s manufacturing processes. It connected quality levels to financial return. Motorola featured Six Sigma in its shareholder meetings as a differentiator in driving corporate value. When Jack Welch, then the CEO of General Electric, was exposed to Six Sigma he instantly understood the power of the process and quickly moved to adapt its principles throughout the GE organization. GE claimed that Six Sigma saved their company over $8 Billion in a 4-year period from the start of 1999 through the end of 2002. Meeting the statistical goals of Six Sigma may require some companies to invest in better, higher cost manufacturing equipment. Capital expenditures and debt service can offset bottom line gains if the company cannot command higher prices for its products. Six Sigma requires a management infrastructure that can add layers to your organization and increase your headcount costs. As Six Sigma has expanded to cover many industries, the rigor of its implementation has suffered in some instances. The result is poor prioritization of projects and work done on processes that don’t meet the “attainable goals” criteria or cannot really generate the customer satisfaction or bottom line results promised by the program. In many companies, the “data-driven” foundation of Six Sigma is challenged by the lack of data collection efficiency and/or the inability to adequately analyze the data in a timely manner. At QLS we see this last point – data collection and analysis – as the turning point for handling all of the other challenges of Six Sigma. In fact, we will go so far as to say that the management of manufacturing data is about to change the way we think about quality and its connection to customer satisfaction and our companies’ bottom lines. 1. Sensors in machining centers and assembly processes are reducing in price and increasing in the sophistication of what they can measure. 2. New shop floor data communication programs are being introduced that connect quality data directly to operators on a real time basis. 3. The role of Artificial Intelligence is growing to foster machine learning that will automatically adapt to suppress quality variation as it occurs. The folks at Trumble have automotive industry backgrounds. Their Reveal™ shop floor data system is being used in engine and transmission manufacturing plants to push synthesized information on a real-time basis directly to dedicated cell phones used by machine operators. As quality variation is detected by sensors on machining centers, alerts showing the high and low limits of the control range show operators that adjustments are necessary – all without the need of data mining or analysis. The result is a very high adoption and “buy-in” rate of machine operators and department managers on the factory floor. When Rexroth merged with Bosch’s manufacturing equipment division in 2001 they formed a team dedicated to data collection in every step of the manufacturing process. Today, they are positioning their product line for Industry 4.0 with products like Rexroth’s ActiveCockpit and the Nexo wireless-enabled nut runner. In ActiveCockpit, Rexroth collects real-time manufacturing data, processes it and presents it on shop floor screens that are also connected to back-end systems such as the company’s enterprise resource planning and manufacturing execution systems. In some plants the system can eliminate all manual data collection and also compare plants around to world to each other to benchmark best practices. Collecting torque readings from nut runners has been done for many years, but the Nexo wirelessly-enabled nut runner takes the torqueing process to a whole new level. Nexo visualizes, monitors, and documents process data in real time building a cloud-based database for all of the nut runners on an assembly line. The cloud database can be easily integrated into other company systems. Plex has grown to become one of the leaders in manufacturing ERP systems and has established its Manufacturing Cloud as its approach to Industry 4.0. Plex has partnered with Shoplogix to collect machine-level data so shop floor managers can see roadblocks, quality variance and process inefficiencies and its IntelliPlex program provides data analytics and reporting applications to make it easy to generate drill-down reports. Plex benchmarks over 400 companies running 1300 facilities around to world for its online manufacturing community. Factivity specializes in manufacturing execution systems based on strong shop floor data collection and intuitive operator user interface. They use a touch screen approach that eliminates the need for bar code readers and provides a completely paperless work order and job packet process. Today, Elm handles only automotive manufacturing plants but their API could easily be applied to any other global industry. The suppliers create the content for the database. Resilinc bills itself as “the LinkedIn for the supply chain community”. They track the information of over 81,000 suppliers to offer resiliency scores for manufacturers seeking new supply partners. Eventually, artificial intelligence systems will use data feed back loops to automatically adapt machining centers to changing quality parameters. Ultimately, additive manufacturing centers will simply print perfect parts. Until that time, QLS stands ready to be your perfect quality liaison partner. During the 1980’s the work that W. Edwards Deming had been doing in Japanese manufacturing from the 1950s through the 1970s finally gained recognition in Western manufacturing facilities. His use of statistical approaches to analyze quality challenges changed the North American manufacturing community from a group that was focused on “the percentage of good parts produced” (and employed entire “work-around teams” to fix the parts that weren’t) to a management approach that constantly focused on statistical process control and the narrowing of dimensional variation. Eventually his work served as a platform for Six Sigma and its focus on parts per million failure rates. When manufacturing teams understood that “80% good” translated to “200,000 failed parts out of a million produced”, the concept of quality excellence was changed forever. In his book “Out of the Crisis” published in 1982, Dr. Deming wrote about 14 points of management centered on a common theme – “The central problem in management and in leadership… is failure to understand the information in variation.” In celebration of the 35th anniversary of Deming’s masterpiece, the QLS team thought it might be interesting to reflect on how our OEM and Tier 1 Supplier clients have embraced his Total Quality Management principles over the years. We see it as “getting back to the fundamentals” just like great sports teams do. We will list Deming’s 14 points and then offer some QLS observations on each point. Create constancy of purpose toward improvement of product and service, with the aim of becoming competitive, staying in business and providing jobs. This one is pretty easy – if you are reading this blog article as a member of a company then your company has met Deming’s Point 1 requirement. If you had not, you would not be around right now as a company. Adopt the new philosophy. Western management must awaken to the challenge, must learn their responsibilities and take on leadership for change. In our OEM and Tier 1 Supplier clients, QLS has certainly seen a true commitment to total quality management. The products they supply today are built to very high standards that are being continuously improved. Cease dependence on mass inspection. Build quality into the product from the start. You might think that this Deming statement would put QLS, a quality containment and parts sorting company, out of business, but we actually applaud this statement and work with both our OEM and Tier 1 Suppliers toward a consistent 0 PPM quality level. We see our role as much more than containment and sorting – our representation of Suppliers in our OEM client’s assembly facilities with the QLS Database portal means that critical communication can be done in real time without the time lapses that can cause lost time and productivity. End the practice of awarding business on the basis of price tag alone. Instead, minimize total cost. Move towards a single supplier for any item, based on a long-term relationship of loyalty and trust. We have certainly seen a consolidation of Suppliers in many assembly plants and that means each Supplier plays an increasingly important role in assuring high quality and consistent productivity. On site Supplier Representation by QLS increases the value perceived by the OEM because loyalty and trust are built one project at a time. We have seen Suppliers convert problem deliveries into service accolades many times because QLS was there, across multiple facilities, to instantly respond to the situation. Improve constantly and forever the system of production and service to improve quality and reduce waste. The concept of Continuous Improvement has made North American manufacturing companies world-class in both quality and productivity. We train our QLS teams to look at the big picture of improvement opportunities so we can inform both OEMs and Suppliers on ways to build stronger supply relationships. Institute training and retraining. The great OEM-Supplier relationships are ones where education of employees is the bedrock of the management process. Companies have employee turnover. Products continuously change. End customers always look for something better. So our efforts to train and retrain can never cease and are a source of stability in our organization. Indeed, we need to constantly look for ways to make that training more effective and long lasting. Institute leadership. The aim of supervision should be to lead and help people to do a better job. Deming understood that there is a difference between leadership and management. For many years companies saw management as a command and control concept designed to tell employees what to do. Leadership is different. It is about breaking down the barriers that keep people from employing their best ideas on how to do something better. It is about providing the types of education that enlighten people and spark new concepts on working together. In our reports, QLS seeks to turn data into insight that leaders can use to paint the big picture of change. Drive out fear so that everyone may work effectively for the company. Creating an atmosphere of rising expectation as opposed to one of retribution is key to the proper leadership of a manufacturing team. Our QLS teams work with OEM employees to help them communicate changes that their company or their Suppliers can make to create better workflow and higher quality. Break down barriers between departments. People in research, design, sales and production must work as a team, to foresee and solve problems of production. This Deming principle is the reason the QLS logo is a three-link chain. We connect OEMs and their Suppliers, but often times we find ourselves linking departments or functional areas of a plant as well. We make the concept of “breaking down the barriers” a central theme of our QLS team methodology. Eliminate slogans, exhortations and targets for the workforce as they do not necessarily achieve their aims. This one makes us smile. Deming was first and foremost a statistician. He spoke with data and constantly focused on explaining variation and had a reputation of being very direct in getting to a point. The targets he refers to in Point 10 are not quality metrics or Key Performance Indicators but rather the generic platitudes that employees can see on a banner every day and eventually simply ignore. One of our core business philosophies at QLS is stated this way – “After all is said and done, a lot more will be done than said.” That’s our way of saying actions speak louder than words. Eliminate numerical quotas in order to take account of quality and methods, rather than just numbers. Deming understood that “shooting for a production number” often blinds manufacturing teams to the bigger picture of operational excellence and quality standards. Today, OEM’s work with their Suppliers to match market demands while maintaining high levels of operational excellence. QLS understands that there are bad ways to generate good throughput – ways that increase costs, generate waste or burn out employees. We constantly strive to find the right approach to generating high productivity with consistently high quality. Remove barriers to pride of workmanship. In QLS’s representation of Suppliers at OEM facilities, we know that we are essentially an extension of the Supplier’s personality and approach to business. If we show honor to an OEM’s employees in a way that increases their pride in craftsmanship and quality, we build stronger relationships between the Supplier and OEM. We are appreciative as an organization to work with a great group of companies whose employees take great pride in delivering excellence to end customers. Institute a vigorous program of education and re-training for both the management and the workforce. It is interesting to see the importance Deming places on education – so much so that he essentially duplicates Point 6 to reinforce it here in 13. In this statement, though, he adds management to the focus of education because he understood that it is impossible to properly train employees if the management team is lacking in up-to-date techniques or information. QLS is positioned to be a source of information that can make both management and employee teams better. Take action to accomplish the transformation. Management and workforce must work together. When employees see management people actively engaged in quality improvement, a different attitude is generated – one of cooperation and team spirit. At QLS we know from many years of working with our clients that people want to do things right – they want to be part of a collective approach that values the ideas and the effort of everyone involved. Our QLS teams are great platforms to facilitate that process. Dr. Deming was a mathematician so it would not have been surprising if his approach to leadership was “by the numbers” – a hard approach to hitting targets. A look at these 14 Points, however, shows that over half of them are focused on the “soft” side of management. He was very concerned about the dignity of people and the engagement of employees. QLS understands the hard/soft balance. Our team members are educated on statistical control and analysis and we have built a web-based reporting process, the QLS Database portal, to make data delivery simple and convenient for both our OEM and Supplier clients. We get the hard side. On the soft side, our team members live in close proximity to the OEM plants they service. They are actively engaged in the same schools, churches and community activities as their clients and we keep in constant touch to be sure that we are honoring their dignity in the QLS work they do every day. Thanks Dr. Deming, for the pioneering knowledge and spirit that launched a quality revolution. We are often asked to explain how QLS generates value for vehicle OEMs and their Tier 1 Suppliers. That question can launch us into a long winded explanation of the critical nature of quality containment, parts sorting, special project work and other quality liaison we perform on an OEMs factory floor, but we felt we needed a more visual approach to telling our story so we developed this infographic. Follow the decision flow in the green area to see what happens when your are working with QLS. See if you can find yourself in the gray area if you do not have a QLS relationship. This chart is a pretty accurate portrayal of QLS's value and our link to OEMs and their Tier 1 Suppliers.